If the target date for humans on Mars is still 2024, then how soon do Space X need to select a crew team and how many in the overall team? I think from a lot of discussion here in the past, a Mars mission involving 6 people found a lot of favour. You could have two separate crews of three or put them all in one Starship. There are arguments for both approaches. I think I would favour a two-Starship approach. But that would imply I think a squad of perhaps 12 potential crew members which you would choose from. This is going to be a complex mission and crew selection will not be down simply to ability to undertake the task. I am sure the "optics" will come into it. Musk has to show this is a mission for all humanity so you will want people from all the major races on Earth, though I would expect them all to be American. There also has to be a gender mix, if not a 50-50 balance and maybe non-heterosexual crew as well. In order to get down to a squad of 12 with the right range of skills, psychological profile and identity etc, I think you would need to start with a pool of probably 100. It seems to me if you are really serious about getting to Mars by 2024 then you are going to have to start assembling your pool of 100 pretty soon, as we are only 5 years away probably selecting in the current age range of 25-40. Key skills for Mission One: medical, engineering (of various types - experts in rocketry, life support technology, metallurgy, 3D printing, electrical engineering etc), IT systems, driving skills and geology. All persons need to be exceptionally fit physically have a good pyschological profile, resilience, good social skills and ability to cope with confinement in relatively small hab spaces. The obvious places to start trawling would be US colleges, US military and lead companies with a strong engineer profile. For Louis .... this topic should have some running room! It seems to me that SpaceX would not attempt something as ambitious as you have proposed, but instead (I would think) they would look to others who have spent years and in some cases decades working the problem. In recent months, there was a post in this forum about a new Russian Mars Simulation, but I couldn't find it. The Russians have conducted long studies in the past, and there are a number of experiments under way. A Google search yielded a long list of past and current simulation experiments. And (it might be worth pointing out) that NASA has been doing crew selection for a while now, and there are a LARGE number of people who have participated in evaluations, of whom only a few have gone on to fly, due to the small number of opportunities. The submarine forces of multiple nations have (by now) graduated thousands of people who might be interested in a trip to Mars as a change of scene. I'm a simulation sceptic and I wasn't referring to simulation but selection. Simulating with people who will never go to Mars is pointless in my view, especially if the simulation is very limited. But simulation with potential Mars crew members, possibly on the surface of the moon - that would be much more relevant. Crew squad selection is going to take at least a year in my view. A lot of the people you want to recruit will need to give long notice or complete degrees/PhDs and so on. Then the training programme is surely going to at least two years. Not sure how the BFR Strship will go about the crew slection but I believe even the first crews to the ISS will also be nasa selected even on the new ship made by spacex for that purpose and for the Boeing starliner as well. Aug 3, 2018 - (CNN)NASA has tapped nine astronauts to become the first to launch to space from American soil since the Space Shuttle program was retired in 2011. 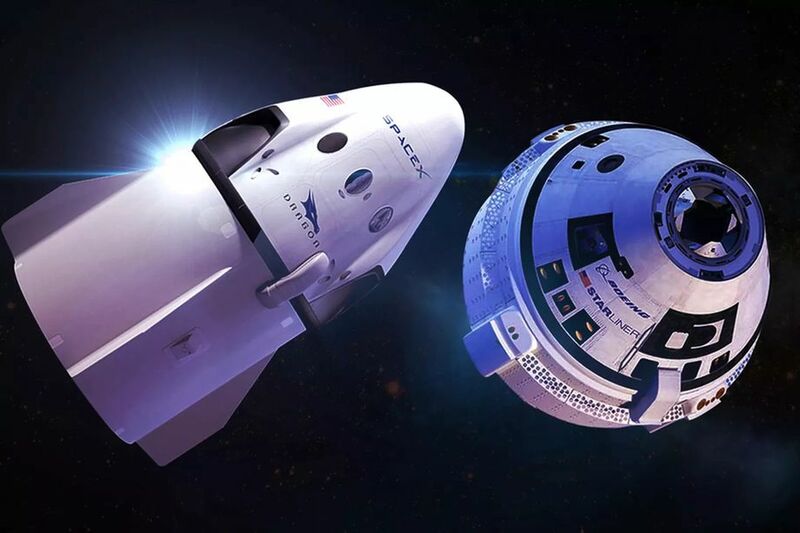 The seven men and two women will also be the first astronauts to fly in capsules developed and and built by the private sector as part of NASA's Commercial Crew Program. Yes, that's the impression I got. But with the Mars Mission, I think Space X will be on their own, although I guess they could attract, or be loaned, people from the NASA roster. Musk has to show this is a mission for all humanity so you will want people from all the major races on Earth, though I would expect them all to be American. There also has to be a gender mix, if not a 50-50 balance and maybe non-heterosexual crew as well. Nah. No need for diversity hires. I doubt they'll all be American. What better olive branch than offering the other spacefaring nations seats onboard? Russia and China at least, and probably Japan, India, and a few European countries. Well I disagree. Firstly, I don't think they will be diversity hires in the sense of simply filling some quotas. But I think they will want to have a spread of faces and skin tones. Within the USA there are probably thousands of people who could qualify for the mission so they will have quite a range of people from which to choose. We'll see, that's my guess. Secondly, I think they will all be American. I think there may well be legal difficulties once you introduce citizens of other countries. Certainly, it would make sense I think to employ only American citizens. Then there is no doubt that it is an American enterprise undertaken by an American company with American citizens. "Currently a six-month mission to the ISS requires up to five years of astronaut training. This level of training is to be expected and likely to be expanded upon for future space exploration missions. It may also include in-flight training aspects. It may be possible that the ISS will be used as a long-duration astronaut training facility in the future." So my 5 year guess wasn't far off! I am sure that could be sped up (NASA seem to do everything very slowly!) but on the other hand, a Mars mission would surely be more complex than an ISS mission, don't you think? I think there may well be legal difficulties once you introduce citizens of other countries. It will be a US flagged vessel operating in what is effectively international 'waters'. Any legal difficulties with having non-American crew will be trivial compared to the other ones they'll face. Since foreign astronauts regularly fly on US missions, there shouldn't be any obstacles to SpaceX offering seats to other countries. The Russian flights also require those that ride to go through there training program as well as learn to speak and read russian so as to be able to operate the launch rocket plus capsule as directed by there commander of the mission. As far as american ships we have not had all that many riding and with the shuttle they were indeed passengers along for the ride. We're talking about a new world here, not nebulous space. All I can say is my gut feeling is that it just makes everything much more straightforward if they are all (exclusively) American citizens. Imagine if you chose a Russian citizen - quite plausible given their excellent record in space - and it just so happened that the Russian citizen is going to be the first person to step foot on Mars...you think Putin and his Machine won't make something of that? And I don't just mean PR - I mean from a legal standpoint. Who gets to do what first would be up for the politicians to decide. If it's an American mission, it would most certainly be an American who gets assigned that role. Do you seriously think they'd just stampede for the exit once they land? These are *astronauts* we're talking about. Professional adventurers. People who are entrusted with vessels worth billions of dollars. If the Americans make it clear it's an American who will get the first footsteps, it will be an American. By the way, the ISS has been commanded by a Canadian before, even though it's primarily a Russian-American project and the only manned flights have been Russian or American. You make my point for me: citizenship is, as you accept, important. If it's important, it's a complicating factor. Why add to the complications by having non-Americans as members of the crew. The only context I could see for doing that is if you couldn't find 12 squad members among the 300 million plus US citizens: unlikely since the US is a world leader in all relevant fields such as IT, engineering and medicine. I think the intent was to go to Mars as all of humanity, rather than just one nation. Obviously the first crew can't consist of every nation, but this is about setting precedent. If we can't convince anyone else to join the project, that still won't stop us from going. However, buy-in from other nations would increase the overall value-add of this project. Colonizing another planet is the mother of all major undertakings. Landing men on the moon was child's play by way of comparison. More intelligent and talented people, wherever they hail from, is better. It's a nice thought but there are a lot of bad actors out there (totalitarians, corrupt dicators, religious maniacs and loony tunes). Either you have a project over which you maintain control or you don't. I want to see a Mars colonisation project that transfers the best of human values to Mars not the worst.